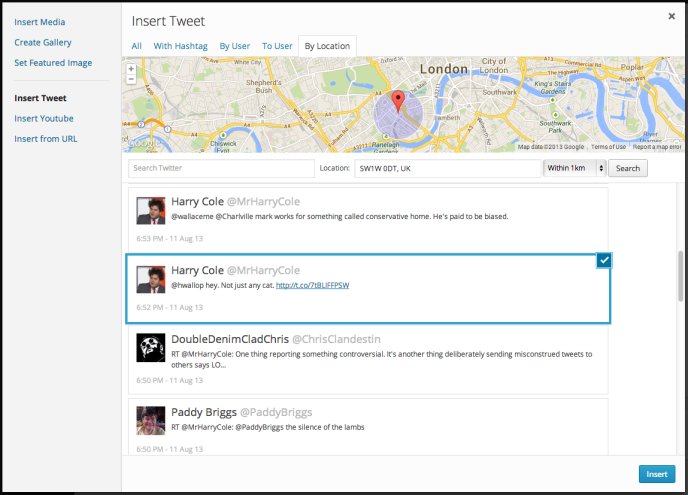 Automattic has released a Media Explorer tool for the WordPress blogging platform that lets authors curate trending content from Twitter and YouTube all without needing to leave their post. The feature is available today for WordPress.com and WordPress.com VIP users. Akin to having Storify right in your WordPress platform, users can click on the “Add Media” button while they’re editing a post and see options to insert either a tweet or a YouTube video. Being able to embed social content like this isn’t new — both Twitter and YouTube have made it possible for a long time, but WordPress is now streamlining it so that you can simply query based on keyword, hashtag, user, or geographic location, and it will populate the relevant content. The Media Explorer tool is currently available to those with blogs on WordPress.com. For those self-hosted, Automattic says that this feature will be available “in the near future” through Jetpack. Releasing the Media Explorer comes as the blogging platform celebrates its 10th anniversary and is seeing more usage around the world.